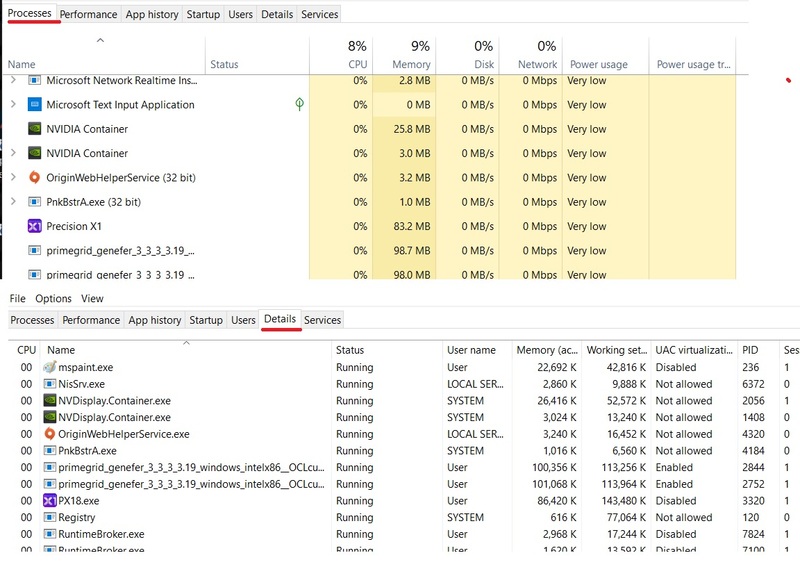 I dont understand why this program use so much cpu. Please look at my screenshots. Cpu usage go from 6.8 to 11.9% all time when program is open. Old EVGA Precision XOC (6.2.7) was running normal with GTX series 1-2% cpu usage. Same for every PX1 version. I just checked my CPU (i7 6850k) usage and I'm seeing something similar to what you're seeing but PX1 is using around 4% of the CPU for me. I swear in previous versions of PX1 (I'm using version 0.3.7.0) that the CPU usage was lower (1-2%). Even at 4% it seems really high for something like this. Same problem, sometimes its only 1% (i7 8086K) and sometimes it goes up to 6%. Usually stays around 2.5-3% usage which is just weird. Im on i9 7980xe 6-11% usage. Yep everything above 4% usage is not normal. So I just realized that PX1 is using 4% of my CPU when the CPU is idle, which means that there is no boost being applied. I just fired up ACOD, which uses the CPU heavily, and after the CPU boosted the CPU utilization of PX1 went from around 4% down to 0.5%. So I'm cool with 0.5% CPU usage for PX1 when after the CPU boosts as that's when CPU utilization matters. See if disabling the osd helps. Just chiming in to say I don't think this is widespread. I'd suspect a conflict or corrupted installation, or perhaps an older version. Not knowing that Card this is A GTX or A RTX but sounds like the older version was not uninstalled and cleaned up from the Computer or the Registry. Turn off the OSD and HWM Apply - Save - Exit PX1 and then start it back you should see the same as the second image. What Version of PX1 is this? What OS is this and What Version is this OS? How many Graphics Cards are installed? RTX 2080TI FTW3 in sli. Yesterday i did clean windows installation. Still have all them Container Running, having 2 Cards you should only have 2 running not 4 + a 32Bit one. GFE in game disabled but running in background. Does X1 still show high CPU utilization if you are running a game? My CPU down clocks itself if there isn't much going on and when it does that X1 is using around 4% of the CPU. If I start a game the CPU does its full overclock and then X1 uses about 0.5% of the CPU. This behavior makes sense as if the CPU is down clocked during times of low usage then X1 will use more of that down clocked CPU. And if the CPU is running at it's full overclock then it makes sense that X1 uses less CPU as there is "more" CPU available. When i play game PX1 use around 4% cpu but when i exit game 8-9%. I tried almost everything to fix this but nop. Only program with this problem. You must also be running GFE. I had high CPU usage when I first installed PX1 but now it has settled. I can't say what is was, I can now turn on the OSD, HWM and LED sync all together and still the CPU usage is 1.8-4%. I just wanted to update you guys and let you know that we are looking into this. I'll keep you guys updated! Thanks very much Jacob. I'll keep a close eye on the CPU usage when using X1. I'll install it later this week (upgrading from XOC 6.2.7) to work with my new RTX GPUs. - Additional information that you think may be relevant. Additional information: tried turning off my processor oc profile (didnt help), installing nvidia without geforce experience, turning off sli and also removing one card from system. Nothing seems to help to fix this. My cpu usage is around 7% when im playing games and doing other stuff (rendering etc...) but when im on desktop using chrome PX1 usage goes above 10%. Post one of the Detail Tab (Sort by CPU) and Exit ALL other Apps like Chrome & Corsair Link.